On 16 April at about 8:30 a.m., the ship entered the Maenggol Channel, in southern waters of South Korea, while en route from Incheon to Je-ju Island. The ship had sailed these waters again in the past. At about 8:40 am, a sudden turn caused the ferry to list. During this time, an off-duty helmsman who was sleeping in his cabin, was awakened when he was thrown against its port side. As of 8:50 am, Sewol was leaning 30 degrees to port. Lights went out. The Captain, who was in his private cabin at the time of the incident, rushed to the bridge, along with ship mates and helmsmen. Around this time, the chief engineer stopped the engines. With the engines off, Sewol became unable to change directions and began drifting sideways. The Captain and crew ordered everyone onboard to stay put. Up to 9:30 am, about 150-160 passengers and crew had jumped overboard. Sewol took two and a half hours to sink. In total, 304 passengers and crew members perished in the disaster, while 172 were rescued. The 9 out of the 304 people are still unaccounted for and presumed dead. The 254 of the deceased were secondary school students and teachers from Danwon High School (Ansan City). Notably, the Captain, the chief engineer, and the chief and second mates were the first people to be rescued. Official investigation has revealed that human error played a significant role not only at the sinking, but also at the extend of death toll. The first step in a ladder of tangible errors was an "unreasonably sudden turn" which caused the cargo to shift and the ferry subsequently to capsize, official reports say. -Overloading: South Korean investigators have indicated overloading as key cause of the accident. The ferry was carrying an estimated 2,142.7 tons of cargo, more than three times the limit of 987 tons. Meanwhile, Sewol was carrying only 580 tons of ballast water, much less than the recommended 2,030 tons, which made it more prone to list. -Securing of cargo: At the same time, the cargo was probably unsecured which made it to shift, further contributing to capsizing. -Lack of experience: An unexperienced third mate was on the wheel when the ship took the fatal sudden turn in the morning of 16 April. There is no law requiring the captain to be on the bridge when the third mate is steering. -Miscommunication: The first distress call came from a boy onboard who called emergency services from his cell phone, while the crew made a distress a few minutes later. A few minutes later, the crew sent the distress to authorities in Jeju -which was the ship's destination rather than near the accident site. -Wrong instructions: Particular attention was given after the tragedy on the fact that the crew was repeatedly recorded as instructing the passengers to stay put, even when water started entering the vessel. Most of the passengers, including the kids, obeyed. 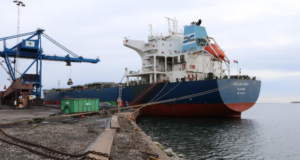 Arrest warrants were issued for a senior vessel safety operator and a vessel inspector of the Korean Register of Shipping's Mokpo unit. Amongst 15 crew accused of the sinking, prosecutors sought the death penalty for the captain under the charge of homicide. The others had lesser charges, including negligence. The Incheon District Court sentenced the late ferry owner's eldest son to three years in prison for embezzlement and breach of trust. The Gwangju District Court found Captain guilty of negligence and sentenced him to 36 years' imprisonment. The judges said that he was clearly not the only person responsible for the tragedy and they accepted that his negligence did not amount to an intent to kill. The chief engineer of the ferry was found guilty of murder and jailed for 30 years. Thirteen other crew members were given jail sentences of up to 20 years on charges including abandonment and violating maritime law. For cargo overloading, the company’s CEO was found guilty of negligence and received a ten-year prison term. Six other company employees also received prison sentences. Following appeals in 2015, the Captain was found guilty of murder and his sentence increased to life imprisonment, while those for 14 other crew members were reduced to a maximum of 12 years, including 10 years for chief engineer. The CEO’s sentence was also reduced to seven years on appeal. It has been clearly determined that this accident constitutes another man-made disaster. 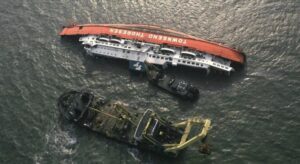 The most tragic lesson following the accident is the fact that hundreds of children were instructed to stay in their cabins, as the ferry began to sink. Most of those who followed the order died, while tragically, many of those who went out on the deck or jumped in the water were rescued. The Captain was taking a rest at the time of the fata turn, leaving an unexperienced third mate alone in the steering house. The ferry reportedly departed by two hours delayed, so it had to speed. The ferry was overloaded, maybe to maximize profit. Meanwhile, local media on the aftermath said the state did not conduct an accurate search and rescue operations when the accident happened. The captain did not declare an evacuation order and insisted passengers to ‘stay put’ even as he was leaving the sinking ferry. 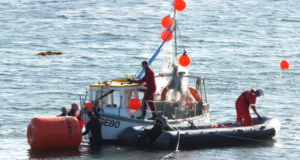 The crew did not have any ferry disaster-management training. Specifically, Lee Sang-Yun, a professor and one of South Korea's leading marine engineers, concluded that many risk elements caused the accident in stages: unqualified personnel, passing Maengol with the strong current in fast speed, overloading, the shortage of ship ballast equilibrium water, lack of a national integrated disaster prevention system, and others. In this respect, this served as a reminder for Korea to reform its approach to disasters and set up a national emergency operation framework, serving as a lesson for other countries to work towards avoiding the same from happening in their nations. Even if safety regulations cannot cover all the possible unlucky scenarios, the importance of a national disaster response framework was considered specifically after the Sewol catastrophe. The vice principal of Danwon High School committed suicide after being rescued, with media attributing the fact to guilt he had survived, while many of the children died. 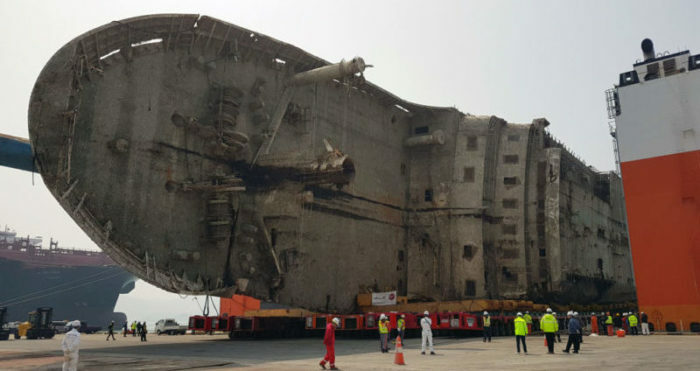 In June 2017, ALE lifting company completed salvage of Sewol wreck. In May 2018, Sewol wreck was turned upright in search of the missing. Seoul Central District Court awarded 200 million won (US$177,000) in compensation for each deceased passenger and 40 million won to parents of students who lost their lives in the tragedy. The court also awarded compensation of 5-20 million won for siblings and grandparents of the deceased.